Authors: Tolokonnikov V.V., Chamurliev G.O., Kantser G.P., Koshkarova T.S., Kozhukhov I.V. The influence of sowing methods and irrigation regimes on productivity of extra-early soybean cultivar VNIIOZ 86 has been studied at Russian Research Institute of Irrigated Agriculture. The use of differential irrigation regimes (70-80-70% and 80-80-70% of FMC) resulted in 2.42 ... 2.51 t/ha yield and mid-level profitability of grain production (80.6%), which was 0.25 ... 0.34 t/ha more compared to the control (80-80-80% of FMC), as synchronization of vegetative growth and reproductive development increased grain amount in total biomass up to 36.2%. Differential irrigation regimes restrained an increase in crude protein level in the seeds (at the level of 35.4 ... 41.2%) compared with the control (36.5 ... 41%). However, they increased fat content in the seeds (18.1 ... 21.4%) compared to the control variant (16.1 ... 18.6%). Optimization of irrigation regime increased protein (up to 0.68 ... 0.94 t/ha) and fat (0.37 ... 0.46 t/ha) compared to the control (0.64 ... 0.83 t/ha and 0.29 ... 0.35 t/ha, respectively). The smallest water consumption coefficient was observed in sites with differential irrigation regimes - 1,174 ... 1,524 m3/t, when in the control site it was 1,651 ... 1,977 m3/t. Extra-early VNIIOZ 86 plants require 8 ... 14 irrigations at a rate of 190 ... 230 m3/ha. It is enough to perform 8 irrigations in relatively favorable years (2013), and up to 14 irrigations in dry years (2014- 2015). To maintain a differential irrigation regime, it is necessary to perform 8 ... 10 irrigations in wet and up to 10 ... 13 irrigations in dry years. The highly profitable cultivation of early soybeans (107.9%) was achieved using drilled sowing (0.30 × 0.042 m) that resulted in significant yield increase (up to 3.02 t/ha) which was 0.41 t/ha higher compared to wide-space sowing technique (0.70 × 0.024 m). soybeans, cultivars, irrigation regimes, yield, growth stages, protein and fat content in seeds. INTRODUCTION Increase in protein and vegetable oil consumption, as well as produce of pharmaceutical and other industries, defines the relevance of the research aimed at optimizing reclamation and other agricultural methods of soybean cultivation, ensuring stable grain yields under limited resource consumption conditions. Soybean is a light requiring crop with a positive response to irrigation. Its world cultivation is concentrated in southern countries such as the USA, Brazil, Argentina, China, and India. Here, natural soil moisture reaches up to 400 mm and growing season is long enough (up to 180 days) which make it possible to cultivate medium-late maturing high-yielding cultivars (up to 3.0 ... 3.5 t/ha) while world yield level averages 2.6 t/ha. Despite the rapid increase in soybean plantings (2.6 million hectares) in the Russian Federation, average soybean yields remain low (1.5 t/ha). The insufficiently favorable natural hydro-thermal conditions for highly profitable soybean cultivation in the main agricultural regions of Russia impel to use early soybean cultivars characterized by low yield level (on average 2 t/ha) without irrigation. Hard weather events that periodically occur during growing season do not contribute to increasing in the seed protein content, which reaches 30 ... 35% of dry matter while US standard is over 35%). Soybean has a high positive response to irrigation, resulting in yield increase from 2.5 to 4.5 t/ha and increase in crude protein content up to 35 ... 45% in seeds depending on the cultivar, agricultural practices [1-3]. However, cultivation process of early soybean cultivars under various sprinkling irrigation regimes and sowing methods is not described enough [4-6]. MATERIALS AND METHODS The experiments were conducted in Russian Research Institute of Irrigated Agriculture in 2013-2017. Seeds of early soybean cultivar VNIIOZ 86 (Volgograd selection) included in State Register of breeding achievements approved for cultivating in the Lower Volga region were used . Irrigation regimes (2013-2015) applied were a permanent one with 80-80-80% of FMC (control) and changing regimes depending on basic soybean growth stages: 70-80-70% of FMC (emergence - flowering at 70%, flowering - seed formation at 80%, maturity at 70% of FMC), and 80-80- 70% of FMC (emergence - flowering at 80%, flowering - seed formation at 80%, maturity at 70% of FMC). We used two sowing methods: wide-space (0.30 × 0.024 m) as a control and drilled sowing (0.30 × 0.042 m). RESULTS AND DISCUSSION The experiments showed that extra-early soybean cv. VNIIOZ 86 requires 2,135 oС of active temperatures during emergence-maturity (92 days) under irrigation to form yield. Soybean plants need most heat (26.1%) during seed formation-maturity, and the smallest heat (9.4%) is required at emergence. In emergence-flowering period the mean temperature is 22.1 °С, and in flowering - beginning maturity period the mean temperature approaches 24 °С, therefore, it is important to coordinate improvement of irrigation regimes with heat availability in crops during different growth and development stages of particular cultivar, smoothing out temperature extremes. Analysis of the photosynthetic activity of VNIIOZ 86 plants showed low formation level of the maximum leaf surface area (25.7 ... 31.3 thousand m2/ha), which is characteristic of early cultivars. The photosynthetic potential (FP) was 1,480 ... 1,880 thousand m2 days/ha, the average daily increase in organic matter was 84.6 ... 95.5 kg/ha, dry biomass was 6.92 ... 7.83 t/ha, and yield was 2.17 ... 2.51 t/ha. The use of differential irrigation regimes resulted in significant increase in VNIIOZ 86 grain productivity (Table 1). Influence of irrigation regime on cv. VNIIOZ 86 productivity Table 1 Irrigation regime, % of FMC Yield, t/ha Deviation from the control 2013 2014 2015 average t/ha % 70-80-70 2.74 2.5 2.25 2.51 0.34 15.7 80-80-70 2.61 2.46 2.19 2.42 0.25 11.5 80-80-80 2.35 2.13 2.04 2.17 - - LSD05 (factor А) 0.16 0.03 0.05 0.05 LSD05 (factor В) 0.16 0.04 0.06 0.06 LSD05 (factor АВ) 0.23 0.04 0.06 0.06 The yield increase reached 0.25 ... 0.34 t/ha or 11.5 ... 15.7% compared to the control irrigation regime (80-80-80% of FMC). High VNIIOZ 86 yields under changing irrigation regimes were formed in 2013 and amounted 2.61 ... 2.74 t/ha, which was significantly higher than in the control variant (2.35 t/ha). Analysis of the plant productivity structure showed that irrigation regimes coordinated with the main stages of organogenesis led to increase in plant number - up to 27 plants/m2, grain mass - up to 9.6 g/plant, grain size - up to 149.8 g/1000 seeds and grain part in the total biomass - up to 36.2% which contributed to yield increase. Differential irrigation did not increased protein content in seeds (35.4 ... 41.2%) compared to permanent irrigation (36.5 ... 41%), since process of crude protein accumulation in seeds is negatively correlated with crop yield, even under irrigation conditions (r = -0.7) . Considering the negative correlation between protein and fat content in seeds (r = -0.5), we established that the differential irrigation regime increased fat concentration in the seeds (18.1 ... 21.4%) compared to the permanent one (16.1 ... 18.6%). Analysis of grain quality characteristics in irrigated soybean showed that it is important to count protein and fat amount per unit of area harvested. Optimization of irrigation regime led to increase in gross yield of crude protein up to 0.68 ... 0.94 t/ha compared to the control (0.64 ... 0.83 t/ha); and fat (0.37 ... 0.46 t/ha) compared to the permanent irrigation regime (0.29 ... 0.35 t/ha). Therefore, it is important to apply differential irrigation regimes concerning growth stages of certain cultivar in order to obtain significant protein and fat levels. The water balance of VNIIOZ 86 soybean plants is composed of irrigation rate (62.9 ... 68.2%), precipitation (24.5 ... 29.2%) and soil moisture (7.2 ... 7.9%). When analyzing dependence of number of irrigations on irrigation regime, weather conditions and water consumption at different VNIIOZ 86 growth stages, it was established (Table 2) that soybean plants required 8 ... 14 irrigations with rates 190 ... 230 m3/ha. In 2013, which was more favorable, plants required 8 irrigations with rate of almost 190 m3/ha. To ensure differential irrigation regimes with irrigation water, it is necessary to perform 8 ... 10 irrigations in wet years (2013) and up to 10 ... 13 irrigations in dry years (2014, 2015). Dependence of irrigation regime on weather conditions and growth stages of soybean cv. VNIIOZ 86 Table 2 Growth stage Irrigation regime % of FMC Year 2013 2014 2015 1 2 1 2 1 2 Emergence - shoot development 70-80-70 20.7 0 26.6 1 21.8 1 80-80-70 32.3 1 35.6 2 30.9 2 80-80-80 30.5 1 35.6 2 31.1 2 Shoot development - flowering 70-80-70 27.8 0 33.1 1 29.1 0 80-80-70 40.4 1 43.8 2 40.6 1 80-80-80 40.7 1 47.8 2 40.4 1 Flowering - pod formation 70-80-70 46.5 2 48.9 2 42.1 2 80-80-70 46.4 2 45.4 2 41.9 2 80-80-80 46.8 2 48.8 2 42.0 2 Pod formation - seed formation 70-80-70 48.5 2 54.1 3 64.2 3 80-80-70 48.8 2 54.3 3 64.4 3 80-80-80 48.9 2 59.2 3 64.0 3 Seed formation - beginning maturity 70-80-70 33.2 3 34.8 3 40.0 3 80-80-70 33.3 3 36.3 3 42.6 3 80-80-80 35.6 3 38.3 3 44.0 3 Beginning maturity - full maturity 70-80-70 19.5 1 17.5 1 16.8 1 80-80-70 19.7 1 18.2 1 16.5 1 80-80-80 34.5 2 34.2 2 33.8 2 Total (emergence - full maturity) 70-80-70 196.2 8 215.0 11 214.0 9 80-80-70 220.9 10 233.0 13 236.9 12 80-80-80 237.0 11 263.9 14 255.3 13 1 - average daily water consumption, m3/ha; 2 - number of irrigations. Permanent water regime was maintained by conducting 11 irrigations in wet and 14 irrigations in dry years. An important characteristic of cultivar in agricultural production is ability to use moisture sparingly when forming yield. Studies have shown that the lowest water consumption - 1,174 ... 1,524 m3/t - was observed in crops grown under differential irrigation regimes, while under permanent irrigation regime it was 1,651 ... 1,977 m3/t. Irrigation is a fairly expensive item in calculation of all production costs (27.8 ... 1. thousand rub./ha), which is 29.9 ... 33.3%. Hence, cultivars forming yields at the level of 2.5 t/ha are characterized by medium profitability (80.6%) and cost value (11.1 thousand rub./t) ensuring low margins. Therefore, it is also important to optimize agricultural practices for early cultivars. For light requiring soybeans these are sowing methods. Cultivar is an important factor in the discussed question about advantages of drilled sowing compared to wide-space sowing under irrigation [8-10]. The early soybean cv. VNIIOZ 86 is characterized by low branchiness and low leaf formation. When crop density is higher (up to 500 thousand plants/ha) beans are formed higher on plants (0.16 m), grain losses during harvesting are smaller (by 0.25 ... 0.45 t/ha as compared to low crop density in wide-space plantings (to 400 thousand plants/ha). Therefore, the research showed that drilled sowing with more uniform placement of plants in rows (0.30 × 0.042 m) resulted in 3.02 t/ha, exceeding the yield of wide-space sowed crops (0.70 × 0.024 m) by 0.41 t/ha. Cost value of grain produced amounted to 10 thousand rub./t, profitability was 107.9%. CONCLUSIONS Under irrigation conditions efficiency of cultivation of early soybean cultivars (VNIIOZ 86) is enhanced by optimizing the irrigation regime and plant growing space. Differential irrigation regimes (70-80-70% of FMC and 80-80-70% of FMC) resulted in yield increase up to 2.51 t/ha, protein and fat content increased up to 0.94 t/ha and 0.46 t/ha, respectively. Drilled sowing of early soybean cultivars led to significant yield increase - up to 3.02 t/ha and profitability of grain production rose up to 107.9%. Borodychev VV, Lytov MN, Soldaev AM, Pakhomov DA. Soya v Volgogradskoi oblasti [Soybean in the Volgograd region]. Volgograd: Panorama Publ. ; 2008. (In Russ). Danilenko YP. 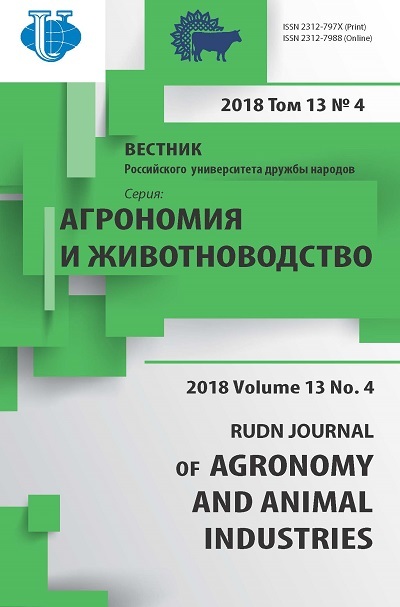 Optimizatsiya tekhnologii vozdelyvaniya sorgo i kukuruzy i soi na zerno v oroshaemykh usloviyakh na svetlo-kashtanovykh pochvakh Nizhnego Povolzh'ya [Optimization of sorghum, corn and soybean cultivation for grain under irrigation on light-chestnut soils of the Lower Volga Region] [Dissertation] Volgograd; 2007. (In Russ). Ovchinnikov AS, Chamurliev GO. Soybean irrigation regime and water consumption under different tillage methods. Proceedings of Nizhnevolzhskiy agrouniversity complex: science and higher vocational education. 2015; (2):13-18. (In Russ). Kruzhilin IP. Optimizatsiya vodnogo rezhima pochvy dlya polucheniya zaplanirovannykh urozhaev sel'skokhozyaistvennykh kul'tur v stepnoi zone i polupustynnoi zonakh Nizhnego Povolzh'ya [Optimization of water regime for obtaining planned crop yields in steppe and semi-desert zones of the Lower Volga Region] [Dissertation] Volgograd; 1982. (In Russ). Tolokonnikov VV, Kantser GP, Koshkarova TS, Plyushcheva NM. A new irrigated soybean cultivar Volgogradka 2. Oroshaemoe zemledelie. 2017; 4:13-14. (In Russ). Chamurliev OG. Rezhim orosheniya i sposoby osnovnoi obrabotki svetlo-kashtanovykh pochv pri vozdelyvanii soi v Volgo-Donskom mezhdurech'e [Irrigation regime and methods of primary processing of light chestnut soils in soybean cultivation in the Volga-Don interfluves] [Dissertation] Volgograd; 2016. (In Russ). State register of selection achievements approved for use [Internet]. Available from: http://reestr.gossort.com. [Accessed 25 September 2018]. Tolokonnikov VV. Teoreticheskoe i eksperimental'noe obosnovanie tekhnologii vozdelyvaniya i selektsiya adaptirovannykh k prirodnym usloviyam Nizhnego Povolzh'ya sortov soi [Theoretical and experimental substantiation of cultivation technologies and selection of soybean cultivars adapted to natural conditions of the Lower Volga Region] [Dissertation] Volgograd; 2010. (In Russ). Tolokonnikov VV, Kantser GP, Koshkarova TS, Plyushcheva NM. The main aspects of agricultural technology for efficient production of soybean under irrigation. Oroshaemoe zemledelie. 2017; (2):17-18. (In Russ). Chamurliev OG, Tolokonnikov VV. Influence of cultivar characteristics and agricultural practices on soybean yield under irrigation. Proceedings of Nizhnevolzhskiy agrouniversity complex: science and higher vocational education. 2015; (3):87-91. (In Russ). Copyright (c) 2018 Tolokonnikov V.V., Chamurliev G.O., Kantser G.P., Koshkarova T.S., Kozhukhov I.V.